It’s not easy to stay on top form through the colder months. After a long season of riding, winter can come as a bit of a shock to the system. Less time on the trains means fitness can fast drop off, and technique inevitably suffers too. This may well be the best thing you do all year. Not only will a trainer help you to keep those legs moving, even when it’s looking bleak outside, you can also use the time to work on your weight distribution and pedalling techniques. Some higher-spec at-home bikes can track your progress and performance – or you can download your data so you know exactly where you’re at with your training. So, whether it’s half an hour a day or two longer sessions per week, be realistic about your needs and tailor your routine to complement this. And once you start seeing some improvement you can always up resistance, time on the bike and/or your own intensity. For those really looking to hit the ground running (or pedalling?) come spring, you’re going to need to build both strength and stamina. You might simply workout within the basic principles of High Intensity Interval Training (HIIT), or you could incorporate weights into your training. This is a great habit to pick up and one that will pay off later down the line. Circuit training classes are largely accessible at most gyms and sports centres – however, if you’re more of a lone trainer, you can also create your own routines to try at home! Build your core, back and shoulder muscles to increase your overall control of the bike, and work your legs so that you can pedal harder and faster than ever! Prolific downhiller Gee Atherton’s strength work ‘…is based around lifting progressively heavy weights, using exercises such as the squat, deadlift, presses, pulls and trunk work.’ You can always tailor your workout to fit your own goals. But be sure to keep your training consistent. As is synonymous with most sports, technique comes first. The aim should be to master the fundamentals. Learn how to keep control of your bike on a variety of challenging terrains, and turn your weaknesses into strengths. From weight distribution to braking, there’s a ton of information out there to help you refine your ability in the saddle. Watch tutorials, read blog posts, buy books. Back in 2008, Malcolm Gladwell made the assertion that it takes 10,000 hours of practice to achieve mastery in a field. 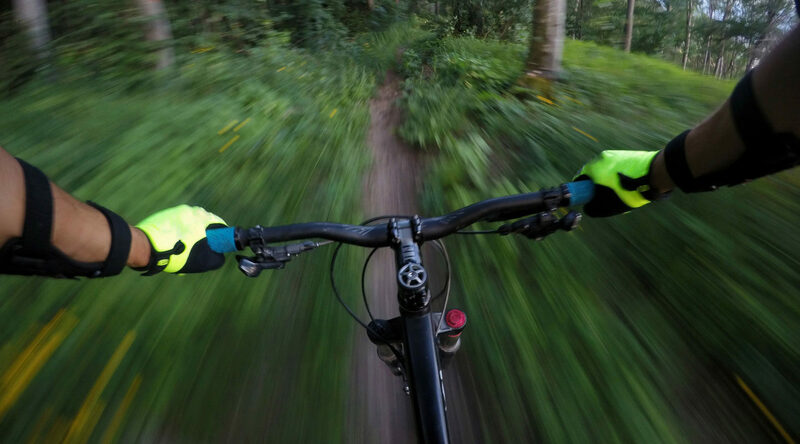 So, whether you’re still relatively new to mountain biking, or you consider yourself seasoned peddler – there’s probably still plenty for you to learn, practice and perfect. Likelihood is that it’s already dark when you finish work during off-season. And that means no evening rides. It means that the daylight hours you spend on your trusty steed are mostly limited to weekends. So be sure to make the most of this time when it comes around. There’s no harm in getting out on the road if you can’t make it to the trail. Put simply, grasp any chance to get those legs moving – go early morning if necessary – and try not to skip a weekend. Easier said than done. But ever-important. You might still be carrying a little bit of holiday weight – and we can’t blame you. It’s much harder to regulate your eating habits over the winter months. Most people are less active during the colder year, and spend more time indoors – and more time looking in the fridge. We’re not saying you’ll need to drastically overhaul your nutritional intake – especially pre and post ride (when you get the chance). Just be smart about what you’re putting into your body – you’ll definitely thank yourself later down the line! Slacking off completely isn’t really an option if you want to continue hitting the heights you reached last year. However over-compensating for lack of riding time can be just as, if not more, damaging. Winter is also a time to rest and recoup from all the physicalities you’ve put your body through in high-season. Finding the right balance – the ying and yang – between training and recovery is incredibly important and could save you from niggly injuries once spring has sprung. Consider taking some time to visit your local Chiropractor. These guys are experts in re-aligning your skeleton – a practice which helps to harmonise your nervous system. Physical therapy and massages are also great for repetitive stress pains and injuries that come from big landings and jarring rides.